The Kit Fox is a light Clan OmniMech with long-range combat as a primary focus, earning it the Inner Sphere codename of Uller, after the Norse god of archery. 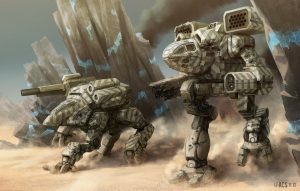 The Kit Fox was another light OmniMech designed by Clan Cloud Cobra, and was first produced in 2890 with the aid of new resources coming from the Tanite Worlds. Rather than emphasize speed, the Kit Fox emphasizes armor and firepower, complementary to the role of the Fire Moth. Clan Jade Falcon Khan Bret Malthus took note of the new design after a string of Cloud Cobra victories, and issued a batchall to the Cobras, a challenge the Jade Falcons only very narrowly won. Clan Snow Raven also produces the Kit Fox, which they acquired by trade. All other Clans field the Kit Fox as isorla, except Clan Blood Spirit, who was gifted the Kit Fox by the generous (or Machiavellian?) Ravens. Often fielded by Clan Jade Falcon, the Kit Fox has a surprising amount of firepower, with the ten built-in double heat sinks sometimes barely able to fully cool the 'Mech down. However, the Kit Fox is somewhat slow for its weight class, only capable of a top speed of 97.2 km/h, provided by a lightweight 180 XL Fusion Engine. Available tonnage is further increased by the use of a lightweight Endo Steel chassis. Four tons of Ferro-Fibrous armor provide the Kit Fox with ample protection. In its primary configuration, the Kit Fox mounts an ER Large Laser and Small Pulse Laser on the left arm as its primary source of firepower. These are supplemented by an LB 5-X Autocannon for tactical flexibility and a Streak SRM-4 rack for close range combat. Arctic Fox - Using a combination of battlefield salvage from Luthien and technical expertise from Clan Wolf-in-Exile, the Kell Hounds constructed the Arctic Fox OmniMech, a reverse engineered Inner Sphere OmniMech based on the Kit Fox. Hollander - Impressed by the Uller-A, the Federated Commonwealth designed its own light 'Mech built around a Gauss Rifle. 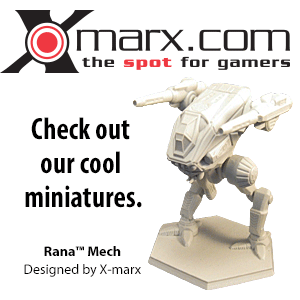 Phelan Wolf piloted a Kit Fox on Strana Mechty, as his first 'Mech after his capture by the Wolf Clan. It was armed with twin ER Large Lasers and twin Kolibri Medium Pulse Lasers, a configuration set up by Natasha Kerensky as part of his training as a warrior adoptee. Khan Connor Rood piloted a Kit Fox, during the invasion of Clan Ice Hellion into Clan Jade Falcon's occupation zone. ↑ 1.00 1.01 1.02 1.03 1.04 1.05 1.06 1.07 1.08 1.09 1.10 1.11 1.12 1.13 1.14 Technical Readout: 3050 Upgrade, pp. 118-119, "Uller OmniMech Profile"
↑ 5.0 5.1 5.2 5.3 Technical Readout: 3050, pp. 16-17, "Uller OmniMech Profile"
↑ 6.0 6.1 6.2 6.3 Technical Readout: 3050 Revised, pp. 14-15, "Uller OmniMech Profile"
↑ Spotlight On: Unending Faith, p. 15 "Uller BLO"
This page was last edited on 5 April 2019, at 14:20.